The way out of "Strong Medicine"
February 5, 2006 -- Lifetime's "Strong Medicine" wrapped up its final season with a minor subplot in which advanced practice nurse Peter Riggs affirms that he would rather be a nurse than a physician. In Diane Messina Stanley's "Special Delivery," Peter resists pressure from his girlfriend, physician Kayla Thornton, to go to medical school, which she calls his "way out of nursing." We give the producers credit for showing that an attractive character like Peter prefers nursing, for highlighting the contemptuous views of nursing that some physicians hold, and for a scene in which Peter makes a diagnosis that an intern has missed. But it's hard to see Peter's marriage proposal to Kayla at the end of the same episode as a sign of nursing self-respect. And aside from Peter's few scenes, the episode proceeds as the cable drama has for six years, focusing on heroic physician characters who provide care that nurses do in real life, while anonymous nurse characters meekly obey the physicians' commands. Although the show has ended production, that grossly distorted vision of health care still airs in reruns for three hours each week. Peter is a nurse-midwife, but recent episodes have found him in the ED with Kayla. Presumably this is so they can experience various issues together, such as the nurse-physician power dynamics explored in an episode late last year. Near the start of this episode, Peter determines that a patient has methanol poisoning as a result of drinking windshield wiper fluid, and he prepares to get ethanol to counteract it. This diagnosis and treatment have eluded the intern on the case, who does not exactly welcome Peter's input. Peter notes calmly that "you don't learn it all in med. school." Resident Kayla, whom the show presents as more or less in charge, looks on approvingly. We appreciate the thought behind this scene, though we would note that showing that an experienced advanced practice nurse knows more than an intern isn't saying much. And Kayla's attitude seems to be that of a proud mentor to a subordinate, though Peter actually has significantly more experience than she does. The depth of Kayla's (right) maternalism soon becomes clear. In a later scene, she presents Peter with a brochure touting the hospital's "medical support staff scholarship." This is apparently a financial program for nurses who want to become physicians. Peter eyes the brochure: "What's this?" Kayla: "Your way out of nursing." Peter: "You're trying to get rid of me?' Kayla: "Peter, you'd make an incredible doctor." Peter (evenly): "But I'd have to go to med. school." Kayla says she knows it's not cheap, but that the brochure explains the hospital's program for "nurses who want to become doctors." Peter (noncommittally): "Wow." Kayla (gleefully): "Paging Dr. Riggs!!" Peter: "Wow." Peter is evidently hoping Kayla will just forget about this, but she comes back to it later, and he feels compelled to explain: "I don't want to be a doctor." Kayla: "Afraid of med. school?" Peter: "No, I didn't say I couldn't be a doctor, I said I didn't want to be a doctor. I like my life the way it is, and being a doctor might make me richer, but it wouldn't make me any happier." Kayla: "It's not about the money." Peter: "Is it about the status--you don't want to be stuck with a guy who's only a nurse?" Kayla: "I was excited about you being a doctor because I love it so much. I figured, I mean, who wouldn't?" Peter: "Plenty of people. Some people don't even like doctors. Not me, but some." Kayla: "Well, I promise, I'm happy with you even though you're a nurse, if you're happy with me even though I'm a doctor." Peter: "More than happy." At the end of the episode, all the major characters converge for the rescue of pregnant series lead physician Lu Delgado; she and her husband have been caught in the collapse of a house basement after a furnace explosion. Lu's husband and Dylan West, a surgeon character, have just managed to deliver her baby. Seeing Kayla assess the infant's Apgar score, the baby-friendly Peter says: "You know, just because I don't want to be a doctor doesn't mean I'd mind being married to one." Kayla: "Peter, are you proposing?" He is, and it seems clear that she will accept. Clearly, Strong Medicine is trying to show nursing some respect. We commend it for having Peter counter Kayla's offensive attitudes, and for having him explain that he'd rather be a nurse than a physician. The subplot addresses the persistent misconception that any smart or able nurse should consider medicine--an assumption that has been a major theme even in Hollywood shows that are less damaging for nursing, notably "ER." In addition, the show has Peter specifically note that he is not rejecting medicine because he could not hack med. school, though this could have been stronger. In any case, "Strong Medicine" deserves credit for making a conscious effort to examine and reject these damaging attitudes. Of course, it does seem that the show cannot imagine exactly why Peter might prefer nursing, if not for the reasons Kayla suggests. All Peter can come up with is the vague statement that medicine would not make him any happier. There are many things the show might have had Peter say to a physician who had just expressed such obvious contempt for nursing. For example, many nurses feel they can improve public health more as nurses than they could as physicians. Consistent with Peter's weak defense of nursing--which is really more a defense of his personal happiness--Kayla's backtracking is totally unconvincing. She did not assume Peter would want to become a physician just because she "love[s] it so much;" she views nursing as something Peter needs a "way out of." And she never does say anything positive about nursing. She is not denying that in the work environment, she values Peter for his physician aptitude, not his nursing skill. The hospital itself seems to share this attitude, since it has apparently designed an entire scholarship program around it--as if the best use of hospital resources in the midst of one of the worst nursing shortages in history is to expressly encourage nurses to leave the profession, and to call them "support staff" while doing it. Peter does not question any of that. Of course, in reality nurses are about 100 times more likely to pursue graduate education in nursing than in medicine. It's also hard not to feel that Peter's marriage proposal so soon after these interactions reflects little respect for his own profession. Of course, there's no accounting for love. But if someone you were considering marrying arrogantly told you that the profession you loved was a dead end and pushed you to pursue their glorious one instead, even thrusting scholarship materials into your hand, it would seem to reveal a serious disconnect that might at least give you pause. Yes, "Strong Medicine" has never let dramatic credibility slow it down, and no doubt it wanted to reach a happy resolution of this relationship for the final episode. But viewers are still likely to get the sense that blind contempt for nursing is acceptable even for nurses' own spouses. In the other plotlines that comprise the majority of the episode, the show continues as it has for six years. The central physician characters direct all important care, issuing commands to silent, deferential nurse-bots and spending significant time on care tasks that nurses would likely handle in real life. Surgeon Dylan conducts all relations with his patients, while surrounding nurses say virtually nothing, as usual. Dylan and Kayla together meet ambulances with no significant nurse presence. In reality, if anyone from an ED is going to meet an ambulance, it is almost certainly going to be a nurse. We commend "Strong Medicine" for a minor plotline designed to show nursing respect. But we have to note that it is undermined by the same problems that have impaired the show's nursing portrayal from the beginning. The show's vision of empowered women in health care, and its laudable concern for public health issues that affect women, has never extended to female nurses. 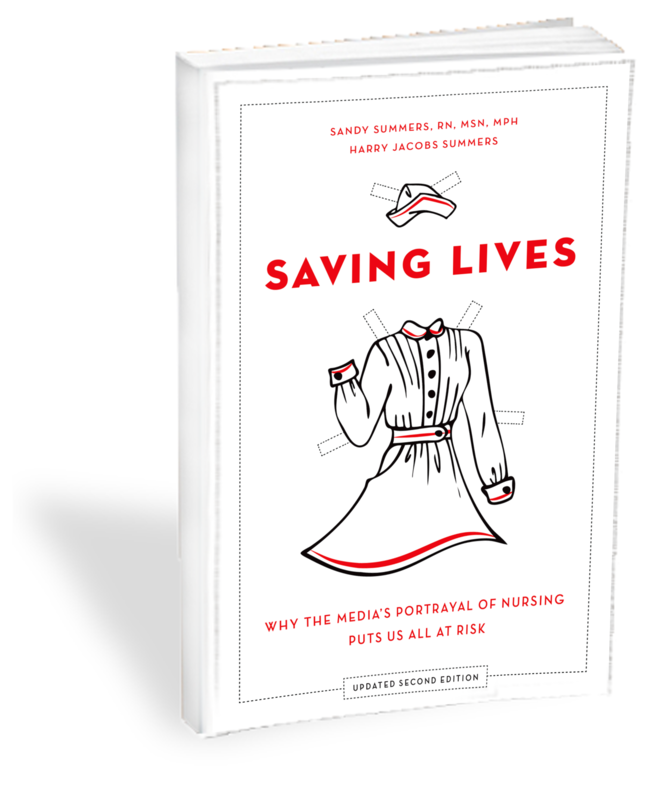 We're guessing it would never have occurred to the producers even to joke that any of their smart, ambitious female characters might consider nursing as their "way out of medicine"--or a way out of today's deadly nursing crisis.